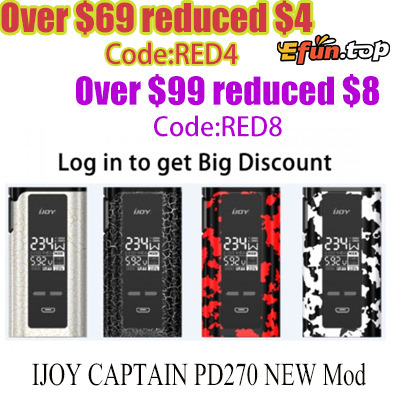 as we all know IJOY CAPTAIN PD270 box mod is very hot in 2017, now the IJOY CAPTAIN PD270 NEWMod realeased.Will it more hot ? IJOY CAPTAIN PD270 NEW Mod, powered by dual 20700 batteries, is able to reach up to a maximum output power of 234W. Besides, when with the 18650 adapter, the box mod could also be powered by dual 18650 batteries.The OLED screen gives the device a unique and classy look. It can be charged and upgrated by USB cable. It can reach NI/TI/SS temperature control.